Home health illness meditation menta health streess wellness Meditation: what is it? What are the benefits? How do you begin to meditate? Meditation: what is it? What are the benefits? How do you begin to meditate? Meditation prevents the manifestation of some diseases. It is amazing how meditation can do so much to maintain a good state of health in our body. Meditation emerges as an efficient tool to combat stress, to fight against the negative thoughts and energies that can make us sick. It is a popular mistake that people living in the West side of the globe believe that meditating is about being able to "put the mind blank": achieving that state of not thinking at all. However, it is very opportune to mention that meditation is a set of practices or actions that anyone can apply which its main objective is to make our mind reaches certain more constructive and perhaps also more productive levels. Meditation is a tool or a very powerful technique since it also helps us to boost our inner energy, to relax and give us peace for a moment ... this practice, if it is kept as something daily or routine, can allow us to face and solve in a more efficient and constructive way those problems or difficulties that can be reflected in our daily lives. And, in the same way, we can optimize notoriously our state of physical, mental and spiritual health to be able to live our life in a full way near to our loved ones without having to experience those stressful situations of pain, despair, anxiety, depression. The specialists in psychology and other areas of the medicine assure that it has been verified that approximately 70% of the diseases that humans suffer are from psychosomatic origin. So if a persona is able to calm its own mind and at the same time prevent negative emotions emerge, it is possible to prevent the origin of many diseases ... perhaps to the point of preventing some types of cancer. Today, in this modernized world, we can find many demands and / or obstacles of economic, social and emotional type ... this of course causes us high levels of stress since we live in a system in somehow "oppressor" ... where if you are not one of the highlights, you will have to fight hard to survive. Meditation can help our body greatly in reducing levels of cortisol (a hormone that can have very negative effects of catabolic type ... and therefore generates a high "unnecessary" energy expenditure) ... it also helps us to find that much needed balance in our endocrine system (the hormone secreting agent) and also helps us to regulate the circadian cycles allowing the melatonin to appear at the moments really needed to induce a deep sleep and to avoid insomnia. In addition to everything mentioned so far, being able to find a space, a small moment to meditate, can help us to regulate our heart rate and thus to lower our blood pressure to avoid cardiac arrhythmias, headaches, nausea , dizziness among other discomforts that may be manifested by this factor (elevated heart rate caused by high levels of stress). 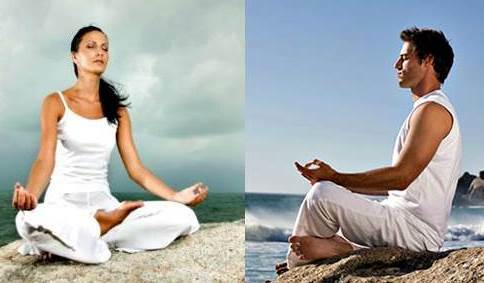 Meditation helps us lower adrenaline levels (since it is a hormone that stimulates glycogen and protein energy expenditure), allows us to increase our lung capacity, makes our memory improve significantly, helps us to be able to concentrate to be able to talk, learn, listen and help us to prevent episodes of depression and anxiety. In itself, what is meditation? Maybe you will say, "If meditating is not putting the mind blank, then what is it?" It is something that sounds complex but really is very simple ... To meditate is to train the mind in constructive and productive mental states, is to learn to distance yourself from negative thoughts, to discard that which damages you, which does not allow you to be calm .... it helps yo to learn to highlight and appreciate the good above the bad. The ultimate goal of meditation is that you can achieve all of this not only when you are willing to meditate as such (look for a space and time to close your eyes, sit or lie down, breathe deeply, etc.) ... but also when you are in situations of your daily living routine in your job, university, with your family, etc. Is to be able to keep calm in situations that could stress and despair anyone who is not able to control their mind, people who are unable to contain crying, despair, depression and anxiety ... that's why it is important that you be able to learn to meditate to achieve all the good that comes with this practice. Keep in mind that strengthening the mind is possible. It is not something that we can only do with our bones and muscles through physical exercise ... since there are also exercises for the mind, to develop different qualities ... although in this case we will focus more on the part of allowing to avoid the bad that comes to you through the negative situations that you can get to experience in your daily routine. Meditation is a practice that requires a lot of dedication and patience since the mind needs to be educated and for this it requires a variable time which in all cases is relatively long. Although we could say the time is focused to grasp meditation as a habit. Some experts say that it may take from 20 to 25 days for humans to make something of a habit if they practice it hard ... the problem is that not everyone has this patience and dedication to take a little time a day to meditate for 20 or more days in a row. The first step is to accept that you need peace in your mind, to accept that your mind "blows" with any type of situation that is presented no matter how good or bad this could be, and that this usually generates despair, stress, anxiety, depression and in general a state of absolute restlessness. The second step is to keep the motivation to start meditation and of course be able to take 10 to 15 minutes a day (at least 5 minutes) to meditate ... because it is obviously something that requires a minimum of time for be efficient and help you improve your general health and wellness. The key point by which you should go for meditation is because this practice will always help you to keep your mind in a constructive, productive and non destructive state. It will also help you to be able to take better decisions in different aspects of your life. 1. The first thing is to try to choose a place, a space in which you know that you will not be interrupted for as long as you want to be devoted to this practice. The most common is a room for yourself all alone, but of course the meditation can be carried out at any time of day and anywhere as long as it is a space where you are not disturbed by other people. It is important that you meditate alone ... or well, in fact you can do it in company but then the people who decide to do it in your same space should also be able to remain silent. Although the ideal is to be alone. Already when you choose the space, you should decorate it: it can be lighting a candle with aroma, put some kind of relaxing music (classical music works very well) ... it is highly recommended to leave aside all that can distract ourselves and that of course includes the very functional but sometimes annoying cell phone. 2. Another ideal thing would be to be able to use comfortable clothes that allow you to relax (you are not going to sleep). It is also ideal to be able to adopt a position that is very comfortable whether in a chair, a sofa, on the floor, etc ... now, if you can not opt ​​for comfortable clothes at least comply with the recommendation of point number 1 and also try to adopt a position as comfortable as possible (obviously I'm not telling you to lie on the floor of your place of work ... unless you see that you can do it without being fired). 3. Program the alarm since it is recommended that if you are just starting in the practice of meditation ... this should not last more than 15 minutes since you could fall asleep and that is not the goal. 4. To allow this practice to become a habit, it is most advisable to practice it at the same hour everyday and if possible also in the same place. Now, you can also program your alarm to help you remember that ... and if you notice that you have a very good memory, then you can do it at different hours if you have difficulty doing it at the same hour ... You can do it several times in the day too. 5. Once you find the place, wearing comfortable clothes and after you adopt a position that you find comfortable, close your eyes and so then look your eyebrows (yes, keeping your eyes closed). Start "watching" how you breathe, your thoughts, your emotions and perceive the sounds of the environment without fighting or letting them bother you. 6. There are types of breathing to start meditating. For example, complete yogic breathing, which consists of inhaling little quantities of air in a long time... it can be put into practice. In an inhalation it is first sought to expand the belly, then allow the chest to experience the same and finally the shoulders. In the part of the exhalation it should be tried allowing the whole body to relaxe. 7. You can also opt for less constant but deeper and diagfragmal breaths. Whatever type of breathing you choose, repeat these steps and "observe", explore your body with your mind ... try to experience the sensations, the sounds ... do not be disturbed by the state of stillness and tranquility to which maybe you were not used to it. 8. I know it is not easy to do everything mentioned here ... but try ... try to find a place to maditate, use comfortable clothes and adopt a comfortable position ... then close your eyes and start to breathe , To try to calm you down.